Complete fertilizer on the basis of several NPK components. 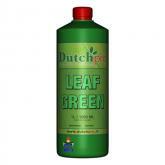 This product has all essential macro and micro growth nutrients necessary for exuberant grow when growing on soil. 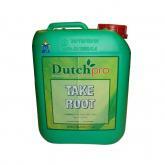 Fertilizer use: Per 100 litre water between 200 and 300 ml Original Grow Soil, depending on the desired EC level. Never mix components in pure form with each other, always first component A, water and then component Bin equal parts. (Always rinse measuring cup well.) 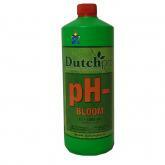 Adjust pH level if necessary with pH- Grow from Dutch Pro. Optimum pH level 5.8 - 6.5. Dosage:: 200-300 ml per 100 liter. In case of contact with eyes, immediately rinse eyes out with plenty of water and seek medical attention. Wear protective clothing - gloves are recommended. Two component soil nutrition for the growth phase. Available in 1, 5, 10 and 20 liters. 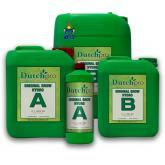 The name Dutchpro may not sound all that familiar, but Dutchpro is in fact one of the pioneers in the field of growing our well-known crop. Some twenty years ago, the first steps were taken to develop specific nutrients by a number of growers who didn't want to settle for the growth & bloom stimulators that were available at the moment. Setbacks were of course a part of the experiences of these pioneers, but by sticking in and the sheer conviction that this whole affair should and must be improved, eventually, a line of nutrients came into existence that met all demands. 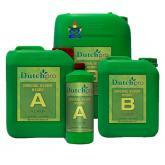 The last couple of decennia, the products have slowly evolved and Dutchpro has played their part in this. Quietly in the background, they have done their homework and developed a complete line of nutrients to fulfill all wishes of the modern grower. After small scale producing for a select group of growers, i.e. 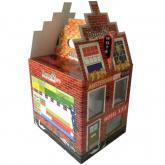 hobbyists, Dutchpro was asked to produce also for a number of retailers. 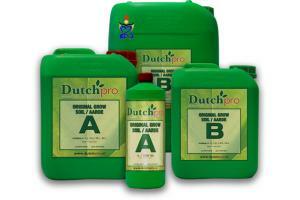 After deliberation, it was decided to grand this request, hence the origin of the company Dutchpro.